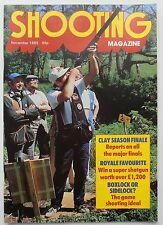 CLAY PIGEON SHOOTING MONTHLY. January 1930. No marks, crease or tears. Used, good condition, see photos. The outer cover is loose but the gun guide is stapled in place. Used, good condition, see photos. FRONT COVER PICTURE - MARTIN CHIVERS. BACK COVER PIC - DON ROGERS. 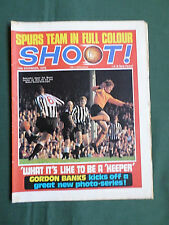 9 copies of Shoot Football Magazine 1973 issues. BACK PAGE PIC-ARCHIE GEMMILL. 1 PAGE PIC-GERD MULLER. 1 PAGE PIC-ACTION SHOT ST MIRREN. 1 PAGE - GEORGE BEST. CENTRE PAGE PIC-LUTON TOWN TEAM. CONDITION -- LIGHT TANNING COLOUR ON THE PAPER - OTHERWISE FOR ITS AGE THIS IS VERY GOOD, NO WRITING INSIDE ,CLEAN AND COMPLETE. Full page colour photos: Howard Kendall (Everton), Rod Thomas (Swindon & Wales), Paul Madeley (Leeds), Dennis Gillespie (Dundee United). 1 PAGE- KAROL DOBIAS. CENTRE PAGE PIC-WEST HAM TEAM. BACK PAGE PIC-GEORGE GRAHAM. CONDITION -- LIGHT TANNING COLOUR ON THE PAPER - OTHERWISE FOR ITS AGE THIS IS VERY GOOD, NO WRITING INSIDE ,CLEAN AND COMPLETE. 9am on a working. Once we have received your request we will then send you a unique authorisation code. How long will it take to get my item?. FRONT COVER PICTURE -DEREK DOUGAN. CENTER PAGES - TOTTENHAM TEAM PIC. BACK PAGE PIC - TREVOR CHERRY - HUDDERSFIELD. Shoot Magazine - 13 September 1986 / Gordon Strachan / Man United / Arsenal Team Photi. Fair condition, small writing on front and crease to back. RIP to front and piece missing from back. 1 PAGE -ROY MCFARLAND. 1 PAGE PIC-IAN MOORE. CONDITION --THE COVER HAS A SMALL TEAR ON THE BOTTOM LEFT CORNER AND A CREASE BOTTOM RIGHT - LIGHT TANNING COLOUR ON THE PAPER-OTHERWISE FOR ITS AGE THIS IS VERY GOOD,NO WRITING INSIDE,CLEAN AND COMPLETE. BACK COVER PIC - KEN WAGSTAFF. DOUBLE PAGE PICTURE - IAN MOORE. FRONT COVER PICTURE - WILLIE MORGAN. 1 PAGE INC PIC - SANDRO MAZZOLA. 1 PAGE TEAM PICTURE - MIDDLESBROUGH. FRONT COVER PIC - ALAN GILZEAN - TONY DUNNE - DAVID SADLER. 1 PAGE PIC - JOHN CRAVEN. BACK PAGE PIC - STEVE KINDON. Includes 3rd Jan - 13th June (23 issues) & 12th December (1 issue). BACK PAGE PIC- SANDY JARDINE. CENTER PAGES PICTURE- MALCOLM MACDONALD. CONDITION --FOXING SPOTS ON THE TOP EDGE OF THE FRONT COVER - LIGHT TANNING COLOUR ON THE PAPER-OTHERWISE FOR ITS AGE THIS IS VERY GOOD,NO WRITING INSIDE,CLEAN AND COMPLETE. FRONT COVER PICTURE - PETER SHILTON. BACK PAGE PIC - DENNIS SMITH. SHOOT MAGAZINE/COMIC. ENGLISH & SCOTTISH SECOND DIVISION TEAM TABS. ISSUED 3RD SEPTEMBER 1977. IN COLOUR-SCOTLAND DOUBLE PAGE. 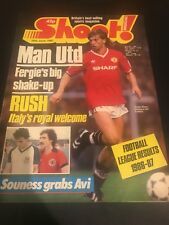 Football magazine from 6th May 1978. Quality as per photographs. Birmingham City team photo. 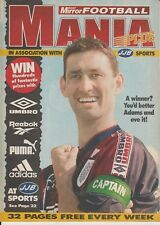 John Gidman Aston Villa. How long will it take to get my item?. Once we have received your request we will then send you a unique authorisation code. Shoot (Monthly) Annual 2007. Mint condition. 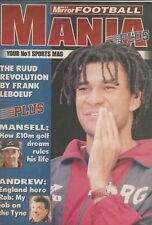 Excellent "All you need to know" series around the clubs from Arsenal to Wigan. 1 PAGE-JOHN TOSHACK. BACK PAGE PIC-PAT STAINTON. CENTER PAGE PICTURE-ALLAN CLARKE. Shoot (Monthly) Annual 2010. Excellent "Let Us take You around the Clubs" series around the clubs from Arsenal to Wolves. FRONT COVER PICTURE - BILLY BREMNER. DOUBLE PAGE TEAM PICTURE- HUDDERSFIELD TOWN. BACK COVER PIC - TREVOR FRANCIS. Magazine issued in 1973 (2 issues) and 1974 (2 issues). Included are Issues dated 7th April 1973, 21st April 1973, 24th August 1974, 26th October 1974. CENTRE PAGE - TEAM PIC - NOTTINGHAM FOREST. FRONT COVER PICTURE - TOMMY MURRAY. PICTURES INSIDE -GEORGE BEST. BACK PAGE PIC - BERT PATRICK. 1 PAGE PIC LOU MACARI CELTIC. DOUBLE PAGE PICTURE PELE. BACK PAGE PICTURE COLIN TODD DERBY COUNTY. 1 PAGE PIC ERNIE MACHIN COVENTRY CITY. 1 PAGE PIC TERRY PAINE SOUTHAMPTON. FRONT COVER PICTURE -WILLIE MORGAN FRANK LAMPARD. FRONT COVER PICTURE - JOHNNY GILES. BACK COVER PIC - JOHN JACKSON. 1 PAGE-RALPH COATES. FRONT COVER PICTURE-CHARLIE GEORGE. CONDITION --LIGHT TANNING COLOUR ON THE PAPER-SMALL TEARS ON THE PAGE EDGES-CREASE ON THE COVER BOTTOM RIGHT CORNER-OTHERWISE FOR ITS AGE THIS IS VERY GOOD,NO WRITING INSIDE,CLEAN AND COMPLETE. 1 PAGE PIC TERRY PAINE SOUTHAMPTON. BACK PAGE PICTURE LEN BADGER SHEFFIELD UNITED. DOUBLE PAGE PICTURE - PAT JENNINGS. 1 PAGE PIC STEPHEN SMITH HUDDERSFIELD. FRONT COVER PICTURE -GERRY QUEEN. BACK PAGE PIC - MIKE DOYLE MANCHESTER CITY. FRONT COVER PICTURE -MARTIN PETERS ENGLAND - DOMAZOS GREECE. BACK PAGE PICTURE - NOBBY STILES MIDDLESBROUGH. 1 PAGE PIC DAVID WEBB CHELSEA. 2 PAGE PIC WITH WRITTEN DETAILS - FRANCIS LEE. 1 PAGE PIC ALAN WHITTLE EVERTON. 1 PAGE ACTION PIC GEORGE CONNELLY CELTIC.